Rev-A-Shelf’s 5386 Pullout U-Shaped Series feature beautiful maple or contemporary gray solid bottoms. Designed for 33” and 36” sink base cabinets, the unique u-shaped frame fits around even the peskiest pipes. Units glide on Blum full-extension, soft-close slides, can be side or bottom mounted and can also be individually door mounted with included brackets. La série en forme de U rétractable 5386 de Rev-A-Shelf comporte de beaux fonds pleins en érable ou gris contemporain. Conçu pour les armoires de base avec évier de 33" et 36", le cadre unique en forme de U s’adapte même aux tuyaux les plus dérangeants. Les unités glissent sur les coulisses à extension complète Blum, peuvent être montées latéralement ou par le bas et peuvent également être montées individuellement avec les supports inclus. 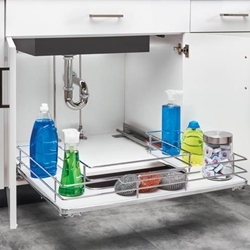 The largest manufacturer of functional storage organizing products, Rev-A-Shelf offers both the professional and the homeowner the finest cabinet storage solutions available. Rev-A-Shelf-Changing the way you think about cabinet organization! Our Product line began as metal and polymer Lazy Susan components manufactured for the largest U.S. cabinet manufacturers and has grown into the market leading innovator of quality, functional residential cabinet storage and organizational products such as Lazy Susans, Kitchen Drawer Organizers, Base Cabinet and Pantry Pull-Outs, functional Waste Containers and Childproof Locking System. The product line currently consists of polymer, wire, wood, and stainless steel components, manufactured and marketed globally to Kitchen Dealers and Furniture Manufacturers, Cabinet Industry Distributors, and Retail Home Centers.